The long-range planes were accompanied by a Su-35S fighter of the Eastern Military District and A-50 Airborne Early Warning and Control Aircraft of military-transport aviation. During the flight, Tu-95MS crews performed aerial refueling, according to the ministry. 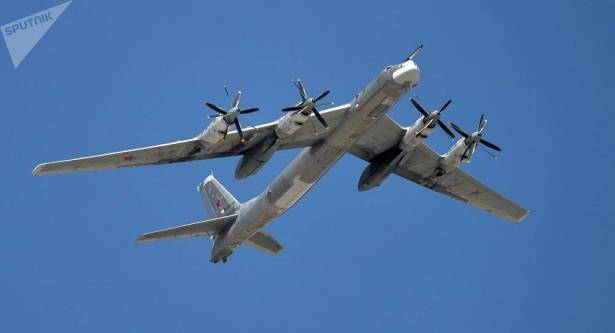 The ministry noted that at certain stages of the route, the Russian strategic bombers were accompanied by aircraft of the Korean Air Force and the Japan Air Self-Defense Force. Russian Tu-95MS strategic bombers have taken part in Russia's air campaign in Syria successfuly launching strikes against the terrorist group Daesh operating in the Middle East. Russia’s military jets regularly carry out patrol flights over the neutral waters of the Arctic region, Atlantic Ocean, Black Sea and Pacific Ocean, the ministry said. All such flights are carried out in strict accordance with the international law regarding the use of neutral waters airspace, without violating borders of other states.